Have you ever been frustrated with your spouse because they forgot to do something that you asked them to do or been accused by your children that “you didn’t tell me” about something that they missed out on (even though you told them five times)? Does the following sound familiar? “You didn’t tell me I needed to wear shoes!” or “You didn’t tell me that today was Grandma’s birthday!” We’ve found that the majority of strife within families is attributed to miscommunication or no communication. While the above examples are minor problems that can occur in families, ongoing miscommunication can lead to more serious issues, such as feelings of neglect and disconnect. In these cases, family members may seek people outside of the family to fulfill their primary sense of care and understanding. Strong families want care, understanding, respect and love to start within their unit. Put it in Writing. – With so much happening around us these days, our short term memories are overloaded (or truth be told short circuiting, in my case). I can barely remember what I had for lunch yesterday. If you want someone to pay attention and remember something, write it down. Keep a Family Calendar. – Have one calendar that shows all important appointments and events for all family members. Make sure everyone has easy access to review and add to it. You can use a dry erase board or wall calendar. My family likes to keep our calendar electronically so that it automatically syncs on our phones and computers and is available to us at all times. When I create an event in my calendar, I simply add the names and email addresses of everyone that I want to send it out to, and it’s emailed directly to those folks. The recipients have the option to accept or decline the events, so you will know if the date/time works for them or not. If they accept, the event is added to their calendar. I also like to add timed alerts to the events so all parties are reminded about the scheduled item. Have Family Meals. – Share one meal together as a family. Turn off the TV and other electronic devices and sit down around a table to reconnect. Ask each other about your day. Home cooked meals add a special touch to the family meal, although they are not necessary. My family has had some of our best times sitting around an occasional box of pizza. Have Family Meetings. – Discuss important issues or events at a planned meeting where every family member attends and participates. Follow our 10 Rules for Successful Family Meetings. Use a Post-It Note. – I love this old school method. It has never let me down. Don’t want to forget something? 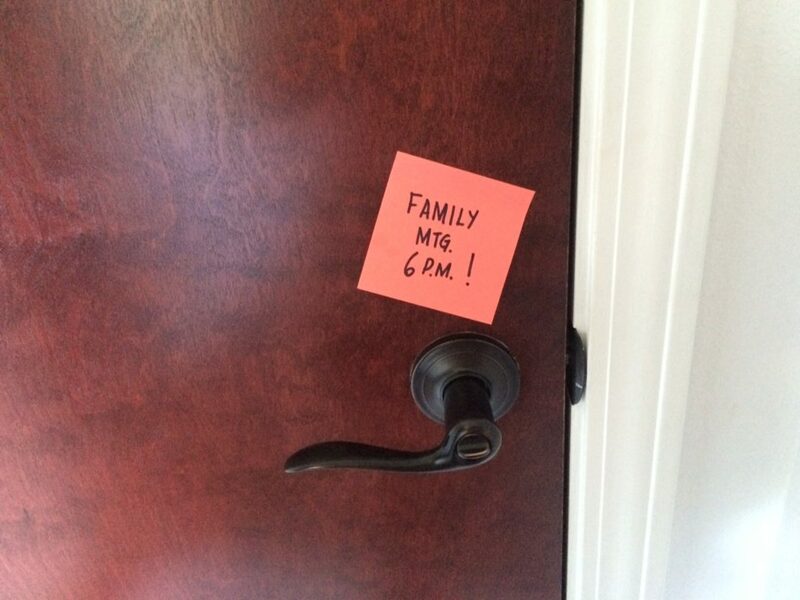 Write it on a Post-It, and stick the Post-It on the door you exit your home from each day. Whether your note says “Take out the trash” “Buy diapers” or “Wear shoes for P.E.,” you’ll be sure to remember. Repetition is key. – In our PR firm, we tell our clients that their customers need to hear the same message at least six times for them to remember it and act upon it. The same goes for family members. Use a variety of these tips to communicate the same message. Refrain from whining. I know that I get frustrated when I’ve told my husband or children several times about something and they forget. I have a tendency to resort to whining, but this is the surest way to have the other person not listen. As soon as whining starts, the other person tunes out. Say “thank you” and “I love you.” – Why is it that many times we don’t show the basic common courtesy to our closest family members that we are sure to show to others? I would never not say “thank you” to someone who did a favor for me, but I recognize that don’t always say “thank you” to my husband when he does the same for me. I’m ashamed to say I fall into this habit. When we assume that the other person knows that we love and appreciate them, we miss opportunities to strengthen our relationships. I know that I get so happy when I hear my son say, “Thank you for making me home lunch today. It was soooo delicious!” that I need to be sure to acknowledge my thanks to others. Remember to be specific about why you are saying “thank you” or “I love you.” It makes the interaction much more valuable. Don’t wait for another reason to tell someone how much they mean to you. Text, call or send a love note today! You can see that many of the above tips are logistical in nature, such as schedule syncing. Smooth logistics establish a positive, free flowing environment that encourages deeper communication, a foundational element to building strong families.